The building was named the Freedom Tower in the first "ground zero" master plan. 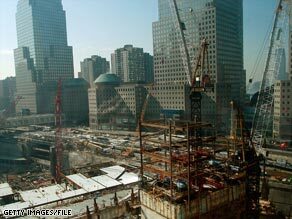 NEW YORK (CNN) -- The agency that owns the space where the World Trade Center towers stood is freeing itself of the term "freedom" to describe the signature skyscraper replacing the buildings destroyed on September 11, 2001. The One World Trade Center skyscraper is expected to be completed in late 2013. The change from Freedom Tower was revealed Thursday at a news conference where the Port Authority of New York and New Jersey announced the signing of the first commercial lease in the building to a Chinese company. The building is expected to be completed in late 2013. "We've referred to the primary building planned for the site as One World Trade Center -- its legal name and street address -- for almost two years now, as well as using the name the Freedom Tower," said Stephen Sigmund, a spokesman for the Port Authority, in a statement released to CNN. "Many will always refer to it as the Freedom Tower, but as the building moves out of the planning stage and into full construction and leasing, we believe that going forward it is most practical to market the building as One World Trade Center." Ten of the building's planned 108 above-ground floors have been built. "The fact is, more than $3 billion of public money is invested in that building, and, as a public agency, we have the responsibility to make sure it is completed and that we utilize the best strategy to make certain it is fully occupied," Sigmund added. He noted that the agency lost 84 colleagues in the September 11 attacks. Mary Fetchet, founding director of Voices of September 11th, a group that commemorates the lives of those killed in the attack, said she was not familiar with the decision made by the Port Authority and was not willing to make a statement. New York Mayor Michael Bloomberg, on the John Gambling radio show taped Friday morning, said he was not upset by the Port Authority's decision. "It's up to the Port Authority," he said. "I have no idea what the commercial aspects are, and we can say, 'Oh, we shouldn't worry about that,' but of course you have to, particularly now. "I would like to see it stay the Freedom Tower, but it's their building, and they don't need me dumping on it. If they could rent the whole thing by changing the name, I guess they're going to do that, and they probably, from a responsible point of view, should. From a patriotic point of view, is it going to make any difference?" He added, "one of the things is, we call things what we want to call them. So, Avenue of the Americas is a good example, for it's Sixth Avenue to most people. Very few people use Avenue of the Americas. If they name this One World Trade Center, people will still call it the Freedom Tower." The building was named the Freedom Tower in the first "ground zero" master plan. Officials said at the time that the tallest, most symbolic of five planned towers at the site would demonstrate the country's triumph over terrorism. Representatives of the Port Authority of New York and New Jersey and Vantone Industrial Co. announced Thursday the signing of a lease that will create the China Center, a 190,810-square-foot business and cultural facility, to be on portions of the 64th floor and the entire 65th through 69th floors of One World Trade Center. Hailing it as a great day for the Port Authority and its partners in the China center, Port Authority Executive Director Chris Ward added, "this is the first step in a long journey as downtown is finally rebuilt." The lease is for 20 years and nine months, beginning when the building is completed, with rents starting at $80 per square foot and escalating afterward. The China Center also will have the right to lease up to two additional contiguous floors under the same terms, an option that expires at the end of 2009. The Port Authority also has commitments for more than a million square feet of leased office space in One World Trade Center from the U.S. General Services Administration and the New York State Office of General Services. Leases for these two public agencies are being finalized. These commitments, coupled with the China Center lease, represent nearly 50 percent of the office space in the building. The China Center at One World Trade Center is expected to represent the elite of China's business and cultural communities and serve as a hub for Chinese firms developing United States operations, as well as for U.S. companies that wish to conduct business in China or expand operations. One World Trade Center will include 2.6 million gross square feet of office space on 70 office floors, a public lobby with a 50-foot-high ceiling, an observation deck 1,265 feet above ground, a skyline restaurant, a wide array of shopping and parking. The building itself will be 1,368 feet tall, and a spire at the top will bring the total height to 1,776 feet. Beijing Vantone Industrial is one of the first private corporations established in China. Today, the company is one of China's largest private real estate investment companies with 13 subsidiaries, including one publicly traded company, Beijing Vantone Real Estate Co.